Republic of Archaeology: B.C. Archaeology Survey, 2016. There’s a survey being taken of BC Archaeologists, First Nation, and other interest groups such as museum professionals, realtors, developers, and interested members of the public. it’s a fairly detailed survey with some quite specific questions about the regulatory and legal process of Archaeology and “Cultural Resource Management” in BC. The survey is run by Joanne Hammond, M.A., an archaeologist based in Kamloops, who also runs the Republic of Archaeology website, which is worth a look in its own right. The survey is only open for another 10 days or so,until December 31st. I took the survey a few weeks ago and I expect if there is sufficient participation then the results will be quite revealing about the present and future of the practice of Archaeology in B.C. If you’ve read this blog much (not that it is getting updated, but still) you’ll know that the context of Archaeology in BC often becomes quite political, and charged with structural as well as unintended conflicts of interest, or the appearance thereof. Working in the colonial landscape we know that those “who control the past” assume upon themselves a lot of power and influence. Is the way that archaeology happens in this Province – almost always in a relationship to development – the best it could be? Take the survey to add your voice. 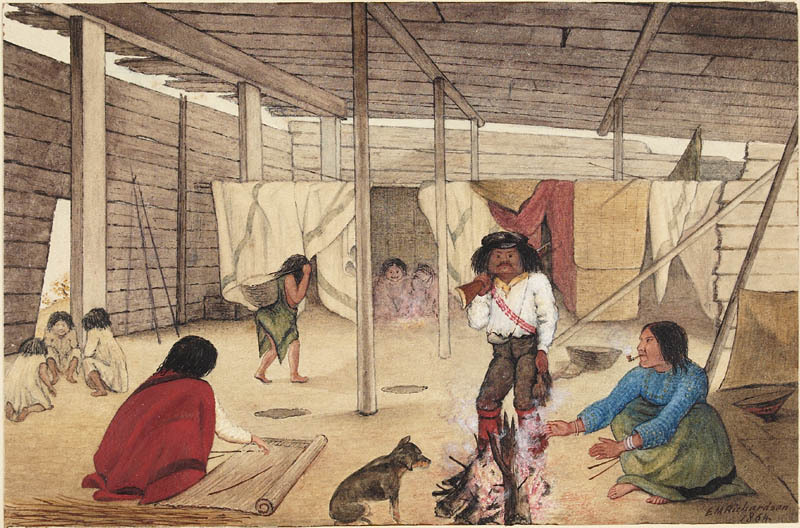 Interior of a Salish Longhouse, 1864. Watercolour by Edward Mallott Richardson. Locale uknown. Source: Canadian Archives. Click to enlarge. Following on from the post about the Salish mausoleum, here is a companion painting by Edward Mallott Richardson from the same year, depicting the interior of a house. It’s a curious painting, seemingly devoid of close detail. Where are all the drying fish?! But at the same time it shows some features of interest which may be worth discussing. Note the fellow with the gun has a powderhorn, for example, and the basket behind him looks like one of those rectangular coiled ones, only with a tumpline, as shown by the woman entering on the left. On the far right is a semi-conical object that might be a hat, sitting on a platform within a small compartment. Last summer we had a good discussion of the vast number of beads coming from some human burials being excavated in shíshálh territory (Sechelt). Tose finds are part of a larger joint research program between the shíshálh Nation, National Museum of Civilization, and the University of Toronto, which has resumed and has a blog. Seated Human Figure Bowl going up for sale? Screen shot of human seated figure bowl on boardroom table. Is this a “wild and wacky [sic] object”? Source: Times Colonist. 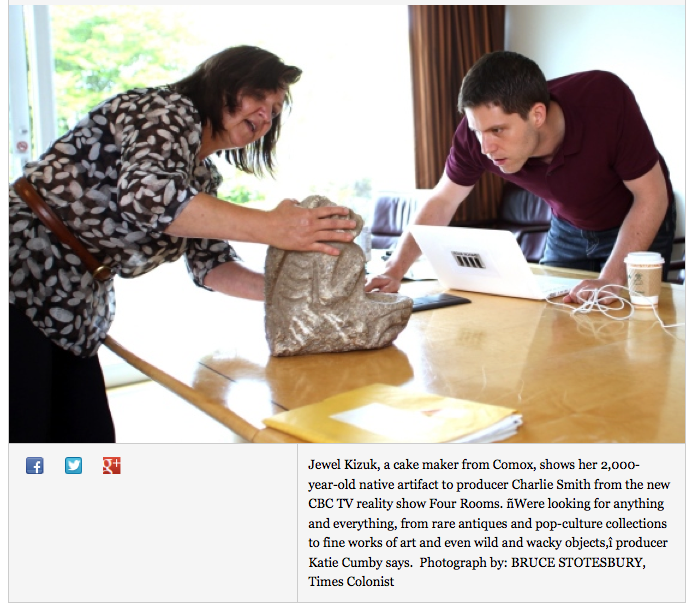 This short piece (PDF) in the Times Colonist caught my eye, and not in a good way. First, a private citizen apparently owns a large human seated figure bowl, an artifact of immense cultural significance, and is apparently willing to enter a process leading to its sale. That’s bad news and potentially extremely inflammatory, especially in the context of the CBC reality T.V, show “Four Rooms” (tagline: “four rooms. four buyers. four chances to make a fortune”). It’s crass and disrespectful to treat these objects like this. The picture above of one casually manhandled on a boardroom table, apparent scrape marks down its side, is angry-making! These objects routinely have handling, viewing, and storage restrictions in museums and at cultural centres. Old site on Calvert Island, Central Coast of B.C. There’s a good, recent article in the Globe and Mail (PDF) on some exciting preliminary findings by Dr Farid Rahemtulla of UNBC at a site on Calvert Island (map). "Progressive Victoria" about to run over the Songhees. 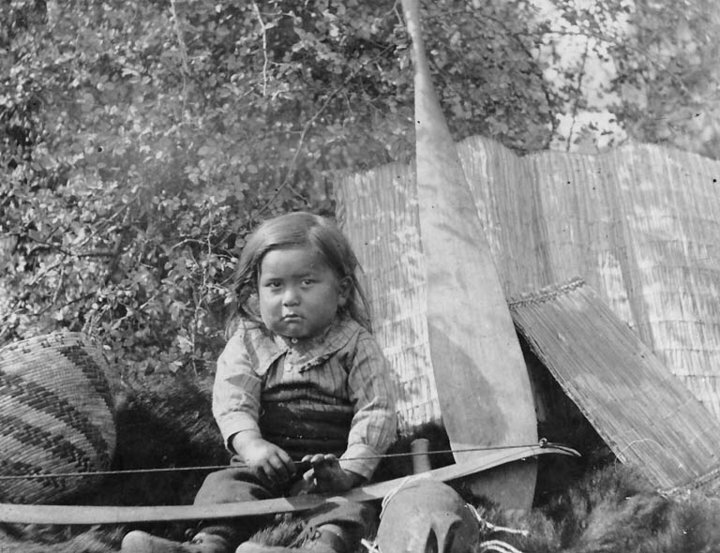 Was there ever a Songhees man with feathers in his hair, fringed buckskin, and a peace pipe? Source: Vincent's Victoria. I mentioned it in a comment the other day so you may have seen it already, but there are a couple of great posts at the blog “Vincent’s Victoria“. The first post is the already-mentioned review of John Lutz’s talk “Getting the Indians Out of Town: Race and Space in Victoria’s History” – Victoria, British Columbia, that is, better known as World Headquarters to this blog. In Vincent’s post we find out about the slow process by which First Nations had their presence in the city core steadily reduced, mainly by moving the reserves, but through other means too. The post then discusses the “Signs of Lekwungen” project which I posted on before. it’s really a shame I didn’t hear about John’s talk until after he had given it – there are other talks in the series but his would have been the most interesting to regular readers here. The second post is extremely interesting, as it uses editorial cartoons from the Victoria Daily Times newspaper to tell the story of the movement of the Songhees reserve in 1910. Enter your email address to follow this blog and receive notifications of new posts by email. No Spam! NW Geology Field Trips Lead to Chert?